Soak glutinous rice with tap water overnight or at least 4 hours. Add rice into a glass dish. Mix coconut milk with boiling water and salt. Stir. Add to rice. The level of liquid should just cover the rice. Steam. To speed up the steaming, microwave the rice and dilute coconut milk for about 4 minutes till very hot. Steam for about 1 hour till cooked through. Cover and leave to cool. 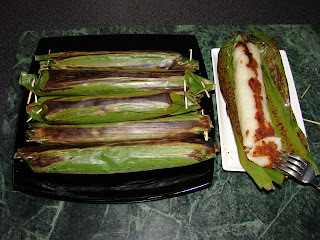 Prepare and cut the banana leaves. Wrap cooked sticky rice as per slide show. * If you don’t like dried shrimps, you can use minced beef (do not blend with spices), stir fry with the blended spices till it is quite dry. Qty of beef use about 250g.